Built-in work item and change-set traceability reduces the complexity of identifying precisely what went into a build. Need to reuse work? Simply drag the change sets associated with that work item into your workspace. Using customizable portal views, you can access information about multiple projects such as news and events, current build status, work in progress and changes that were requested. You can see what other teammates are working on, and view their online status and availability. 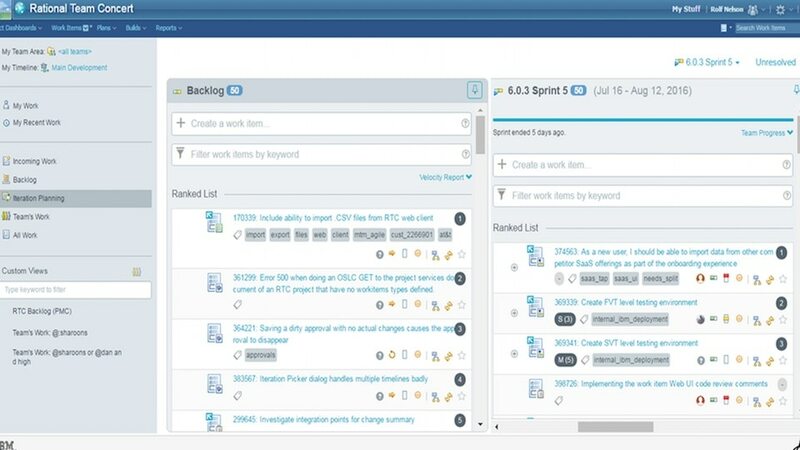 Rational Team Concert software automatically creates and tracks the progress of individual work items according to the team’s agile, SAFe or custom process. Efficiently plan sprints across teams and programs. The software provides advanced software version control, workspace management, distributed source control and parallel development support to individuals and teams. It improves productivity by automatically tracking changes to artifacts. RTC enables a virtually unlimited suspend-and-resume feature to handle work interruptions. Keep your teams on target with report automation, analytics and dashboards for predictable outcomes. Any user can build custom reports or use one of hundreds of available preconfigured reports. Current system requirement reports can be dynamically generated using the Software Product Compatibility Reports (SPCR) tool.